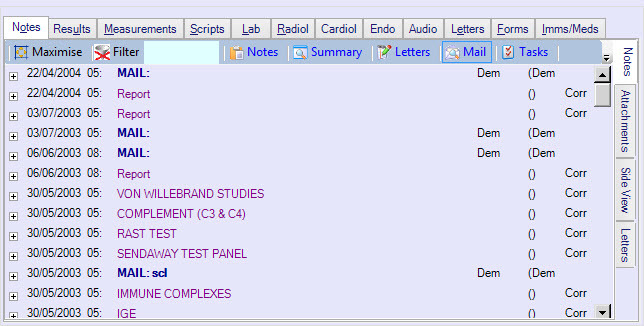 Move to the Notes tab at the bottom of the clinical notes screen. To view all Mail, select only the Mail button at the top of the tab. To just view letters that you have created, move to the right-hand side Letters tab. Double click on a letter to open it in another window. Send to Letter Writer: places the contents into the current letter writer. You can then modify it and re-address it to other recipients. Copy document to current complaint: adds the letter to your current complaint, as an attachment. You will be able to edit the contents. 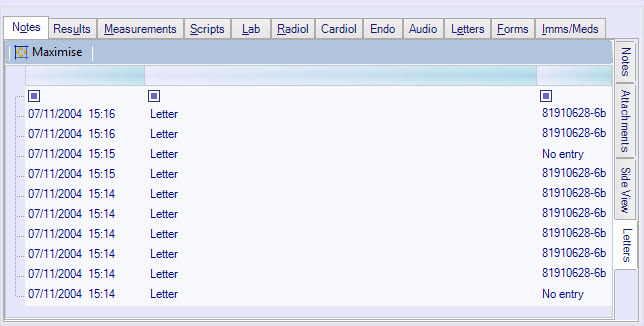 Re-file to different patient: allows you to reassign the letter to a different patient. Re-Label: allows you to change the label (description) of the item. This is the description that appears in your list of clinical notes.